The words of Mason Crane back in April. Despite his modest age the leg-spinner, not overawed or over-excited, was happily and quietly going about his business with the maturity of someone much his senior. It’s a temperament labelled at matching that of Joe Root, while the baby-face of the Shoreham man kept the comparisons going further. That may not be where the assessments stop in similarity. As long as 18 months ago, in the bare infancy of his life and career, Crane had been labelled for England by former international Stephen Harmison to be the third spinner on the tour to Pakistan. You sense with Crane that this is not merely some media façade to fade away attention, and that his sense of care is genuine and working. Performances like Hampshire’s win over Nottinghamshire will certainly do him no harm. “One game at a time,” he’d probably tell people right about now. Six wickets on a cold and, at times, damp Ageas Bowl is no mean feat in itself, but the nature and temperament of his bowling style suggests that Harmison, and Dale Benkenstein, who called him ‘world-class’ may not be too far off the mark. Playing against a dogged Nottinghamshire in the first innings, Crane removed the unusually obdurate Dan Christian, followed by Brett Hutton and Luke Fletcher within the space of five overs, all while going for fewer than two runs per over. It wasn’t to end there. Under pressure from an attacking Brendan Taylor and Samit Patel, fresh from his mammoth display against Warwickshire last time out, Crane went for boundaries as the visitors threatened their 305-run target. But, standing firm, the youngster had both dismissed, while also taking another wicket and claiming a vital catch down at deep fine leg. Not a bad “one game at a time” moment for the man given a breakthrough award last season. Hampshire won by 69 runs. “It’s brilliant to get that recognition, particularly from guys who have had such good careers, to get anything from them is amazing, but I think we may be getting ahead of themselves a little bit,” he said. “Hopefully in a few years I can be pushing on for accolades like that, but for now I just want to contribute. “It’s one thing taking wickets, but if you do it at a really important time, it counts double for me. “I hope I haven’t peaked. I felt that I got better over the winter and that I can continue to get better and that’s promising for me. 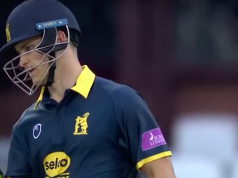 A humble hard-worker, who’s set to improve, Crane made his mark by becoming the youngest Hampshire player to take ten wickets in a match last season, while also dismissing Kumar Sangakkara for his maiden Twenty20 wicket. But even after the dizzying heights of 2015, the praise from those who have been in the game, and the expectations on his shoulders, there was admittance before the season of development and improvement from the man himself. He continued: “Any exposure to first-team cricket is excellent for a young player such as myself, so I’ll be working hard to try and be picked for all those games. “But I understand that I’m only 19. I’m not going to be picked for every game and that’s something I’m very much aware of, but when I am called upon I hope I am in a position to play my part. “I’m honoured just to be on the same park as someone like Sangakkara, with the amount of runs he’s scored, and to get him out was just an absolute dream for me. Resuming on 189-8 on the fourth day, Crane also took his team further on in the game with some handy runs, potentially the most valuable 13 not out of his career to date, given it helped Hampshire to a first win of the season. With the division expected to be tight, the importance of his and his side’s contribution, cannot be undersold to a spinner who holds his figures in much higher esteem when having a higher benefit to the team. And while Tino Best will take the applause for his four wickets and an extraordinary, seemingly match-winning pair of spells, one particular 19-year-old leg-spinner can look back on his game, and season to date, with a great deal of satisfaction. And deservedly so too.